Given the secular nature of many aspects of society, scholars often neglect the role that religion has played—and still plays—in the development of virtually every aspect of civilization. It is impossible to look at world history, politics, or culture without taking into consideration the impact religion has had over the centuries. The scholars will form working groups that focus on history, international relations, literature, music, and sociology to investigate the influence of religion across all five areas as well as the influence those areas have on religion itself. Though there has been an increase in universities opening centers for the study of religion—most often focusing on Judaism or Christianity—this has only furthered the separation of religion from the whole of the humanities, arts, and social sciences. The increased compartmentalization of religious studies into independent fields of research exacerbates the problem of removing religious inquiry from a broad range of fields. Due to this separation, a more comprehensive understanding of religion and its effects on society has been elusive. Many in the academic community work from the assumption that most cultures are moving toward a post-religious existence, making scholarship that focuses on religion and its cross-disciplinary influence a challenge. As a result, fewer resources in recent years have been dedicated to this area of study, and exploration into the subject, at times, has reached a standstill. “The deep scholarly knowledge of religious traditions, essential for understanding much of the culture of the past, has been in short supply. Academic indifference to these traditions is common,” Roche says. The scholars involved in Religion Across the Disciplines will open a neglected but much needed area of research, says Notre Dame participant Christian Smith, William R. Kenan, Jr. Professor of Sociology. Because young scholars must carry the project forward, another integral aspect of Religion Across the Disciplines is the inclusion of academics at every stage of their careers. “It is graduate students and junior faculty who will set the agenda for scholarship and teaching for the next generation, so their central role in this project is critical to its success,” says Desch. Analyzing disciplines and formulating strategies for increasing the breadth of academic scholarship does not create long-term change. In order to sustain the research these scholars are initiating, transformation across and throughout many levels of academia must occur. Graduate students who focus their research in the following fields will be chosen to work on the project: English, history, literature, medieval studies, philosophy, political science, sociology, and theology focusing on humanistic, rather than confessional, inquiry. Through a competitive selection process, five graduate students will be chosen each year as Mellon fellows to participate in the working groups. During their time on the project, they will take part in workshops with faculty and mini-conferences, where each will present their findings and compare strategies for change in how this area scholarship is approached. The Religion Across the Disciplines research will begin during the 2010–2011 academic year and will extend over a four-year period. At the conclusion of the research period, the results and recommendations of the working groups will be disseminated through special sessions at disciplinary conferences, disciplinary journals, the Internet, and co-authored publications. Using a variety of venues to disperse the information will serve the project goal of reaching as many scholars as possible to begin a systemic change in religious research and scholarship across all areas of academia. “Studying the cross-disciplinary influence of religion takes on a special resonance here at Notre Dame and in the College of Arts and Letters, in particular. Our strength in the field of religion across diverse areas of inquiry positions us to lead this important new research project,” says John T. McGreevy, I. 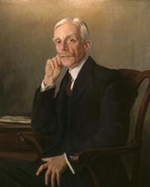 A. O’Shaughnessy Dean of the College of Arts and Letters. The Andrew W. Mellon Foundation is a not-for-profit corporation established in 1969. It bestows grants in five program areas including higher education and scholarship, scholarly communications and information technology, museums and art conservation, performing arts, and conservation and the environment. Only institutions that are either “leaders in fields of Foundation activity” or “promising newcomers” who demonstrate they are in a position to forge new discoveries in the goals of the program are awarded funding. Originally published by Michael O. Garvey at newsinfo.nd.edu on July 14, 2010.